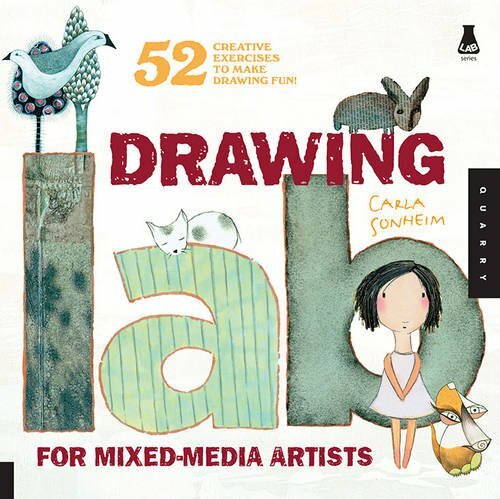 Drawing Lab for Mixed-Media Artists is a fun book by Carla Sonheim that wants you to discover the fun of drawing, or to draw with child-like wonder. No experience is required. You just have to open your drawer, your pencil case and use whatever that's inside and draw. Collected within are 52 exercises each talking about either a technique or subject matter. It can be drawing your pet, at a coffee shop, a portrait, animals, or other things from your imagination. The book place emphasis on the fun factor so there's no need to stress out even if you don't like the look of your own drawing. No judgement. Since the book's about mixed media, there are many exercises that use a variety of tools to draw. It can be pencil, pens, or some sort of paint, or drawing from the eye dropper of an ink bottle. Anything goes really, as long as it can make a mark. I recommend this to anyone who just want to relax, explore their creative side, or have some fun drawing activities with your kids. If you like this book, check out Urban Watercolor Sketching: A Guide to Drawing, Painting, and Dreaming in Color and The Creative License too.